Rendering of the Chrysalis alpha stage in use, including suspended speakers and lighting equipment. (Click for a higher-resolution version.) The beta stage is to the right (stage left). Image © 2015 Marc Fornes; used with permission. tl;dr: I discuss how the Chrysalis will function as a professional stage, as designed by the theater consulting group of Arup. 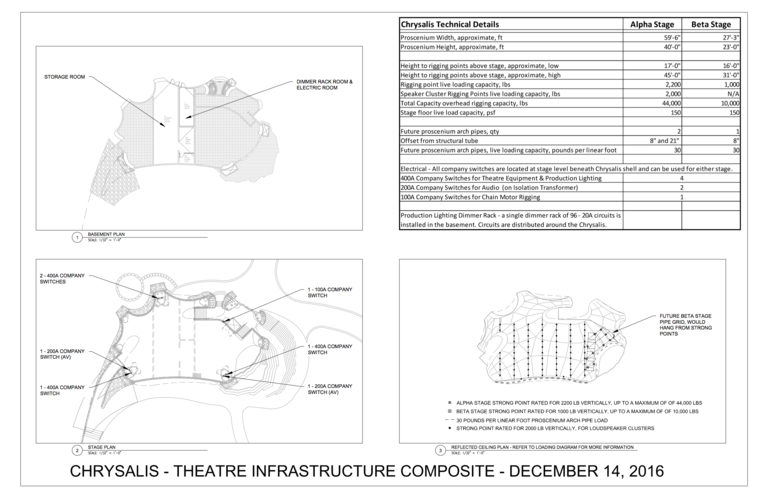 This article is one in a series exploring in depth the creation of the Chrysalis amphitheater in Merriweather Park at Symphony Woods in Columbia, Maryland. For the complete list of articles please see the introduction to the series. The previous article in this series focused on the overall architectural form of the Chrysalis amphitheater, designed to function as a stage, pavilion, and sculpture for Merriweather Park at Symphony Woods. In this article I discuss in more detail those aspects of the Chrysalis relating to its function as a professional performance stage. 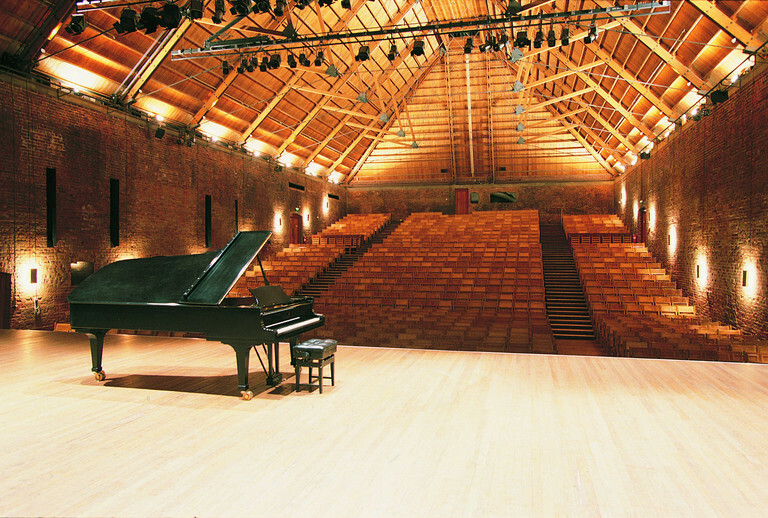 Snape Maltings Concert Hall, built in 1966-1967 as part of the repurposing of a old malt house in the village of Snape, in Suffolk, England. (Click for a higher-resolution version.) This was one of Arup’s first major projects in theater design and acoustic consulting. Image © 2016 Arup; from the Arup Journal 50th Anniversary Issue. Arup Group Limited, usually known simply as “Arup”, is a large consulting firm with more than 13,000 employees and offices in almost 100 locations around the world, including New York and Washington DC. Originally founded in 1946 by the British engineer Ove Arup, Arup the firm is known in particular for its collaboration with leading architects to create innovative and iconic structures, including (among others) the Sydney Opera House, the Centre Pompidou in Paris, the Øresund Bridge between Denmark and Sweden, the Lloyd’s of London headquarters and 30 St Mary Axe (“The Gherkin”) in London, the National Stadium (“Bird’s Nest”) and National Aquatics Center (“Water Cube”) built for the 2008 Summer Olympic Games in Beijing, and the China Central Television (CCTV) headquarters, also in Beijing. For the most part eschewing the role of project architect, Arup instead concentrates on all the other design and engineering consulting work needed to translate architects’ visions into reality. In particular this includes practices in theater consulting, acoustic consulting, structural engineering, and lighting design, with Arup having worked on several dozen projects worldwide involving concert halls, indoor and outdoor theaters, and similar structures. Given Arup’s broad range of expertise and their reputation for working with leading architects, Arup was a natural choice for the Inner Arbor Trust to include on the design team for Merriweather Park at Symphony Woods and for the Chrysalis in particular. Raj Patel of Arup’s New York office–Arup principal1, global lead for theater and acoustic consulting, and arts, culture, and entertainment business leader for the Americas—was introduced by the Trust at the “Designers of Delight” presentation in November 2013. Patel discussed several Arup theater projects, from the Snape Maltings Concert Hall (see the figure above) to the recent Jerome Robbins Theater in the Baryshnikov Arts Center in New York City. Examples of two possible audiences for a Chrysalis performance: 2,000 people seated on the lawn for a performance on the alpha stage (L), or 1,000 people seated on the lawn for a performance on the beta stage (R). (Click for a higher-resolution version.) Images © 2014 Arup; included in the Inner Arbor Trust presentation to the Howard County Design Advisory Panel. The purposes that the Chrysalis is to fulfill influenced its overall design. As noted previously, Michael McCall of the Inner Arbor Trust described the Chrysalis as a combined stage, pavilion, and sculpture. Setting aside the functions of pavilion and sculpture, the simple word “stage” contains a host of questions regarding what types of performances the Chrysalis might host, how the sights and sounds of those performances are to be conveyed to the audiences, how many and what kinds of people are part of the audiences, how those people experience the performances, and so on. For an example of how the answers to these questions influence the form of a performance space, look no further than Merriweather Post Pavilion, neighbor to the Chrysalis. When it was originally constructed Merriweather Post Pavilion was conceived of as a summer home for the National Symphony and a venue for other “high culture” performances, including dance. Thus the audience area was relatively small and featured conventional seats, and the venue and stage were designed for acoustical performances. However, after the National Symphony went bankrupt Merriweather Post Pavilion eventually evolved into a venue for popular acts featuring amplified music, with the seating area expanded and additional audience seating space used on the lawn above the pavilion. Some of the decisions about the Chrysalis were made early on, as part of the development of the Inner Arbor concept plan and prior to the design of the Chrysalis itself. In particular, the concept plan included provision for both indoor theaters and an outdoor stage, the so-called Treehouse amphitheater, in a proposed “performance park” area of Symphony Woods. The role of the indoor theaters was eventually taken over by the cultural arts center now being proposed for a site across the street from Merriweather Park to house Toby’s Dinner Theatre and other functions, leaving the outdoor amphitheater to be addressed by the revised Inner Arbor plan. Since the amphitheater was to be located in a more forest-like section of Symphony Woods, and since an explicit goal of the Inner Arbor plan is to preserve as many trees as possible, the Inner Arbor Trust opted not to install fixed seats or benches in Symphony Woods itself. Instead audiences will sit on the lawn or (for larger events) stand. Also, since the amphitheater was only a few hundred feet from South Entrance Road and the proposed route of a future larger street, the ambient noise level dictated the use of amplification for performances. This in turn opened up more possibilities for the amphitheater structure itself, which did not need to take the traditional form of an acoustic shell. The result was the unconventional form of the Chrysalis as we know it today. 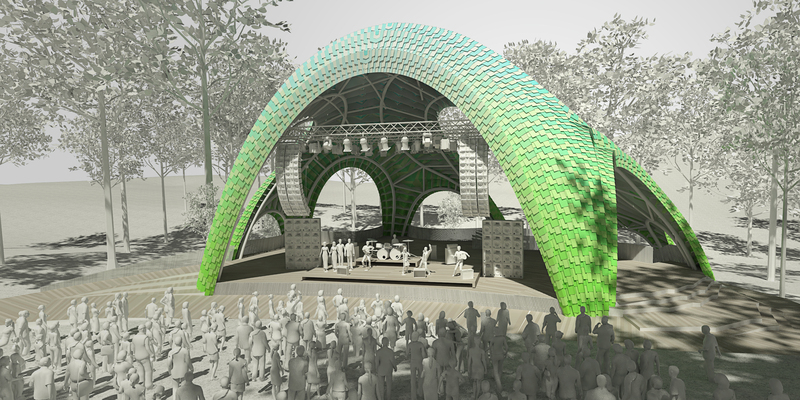 The combination of lawn seating and sound amplification matched up well with the planned uses of the Chrysalis as a secondary stage for Merriweather Post Pavilion (for example during music festivals) or as a primary stage for events like Wine in the Woods. The hill facing the Chrysalis, which serendipitously has a gently sloping natural 5% grade, can easily accommodate audiences of up to 2,000 people if seated (see the figure above) and many more than that if standing. At the same time there are other possible events that generally play to smaller audiences—local groups and solo performers, small plays, and the like—and will not need that much stage space. Rather than force these performances to use a large stage, the Chrysalis was designed to have a second or “beta” stage facing a different part of the hill, one that can accommodate audiences from 100 to 1,000 people if seated, and more if standing. Unlike the main or “alpha” stage, the beta stage also has terraced steps forming a thrust stage to provide a more informal and intimate relationship between the performers and the audience. Examples of two possible setups of the Chrysalis alpha stage, for a pop group (L) and for a lecture to an on-stage audience (R). (Click for a higher-resolution version.) Images © 2014 Arup; included in the Inner Arbor Trust presentation to the Howard County Design Advisory Panel. However, even the addition of the beta stage did not address the full range of demands that are likely to be placed on the Chrysalis. Some performances and other events will be so small scale that they may need to accommodate an audience of only a few dozen to a couple of hundred people. For many such events, such as book readings or lectures, it may also be preferable to provide formal seating arrangements for the audience, as opposed to having them sit or stand on the lawn. To address these requirements the Chrysalis is designed so that the stage can also be used as a seating area for the audience in addition to a performance space, with the whole event then taking place under the canopy of the Chrysalis. This also provides the audience at least partial protection from any inclement weather. The resulting Chrysalis stage as designed and constructed is quite large: about 4,500 square feet for the main stage floor, with a “performance zone” for the alpha stage about 50 feet wide and 40 feet deep—roughly comparable to the stage at Carnegie Hall and to the old Merriweather Post Pavilion stage prior to the construction of the new stagehouse. There are also additional areas “in the wings” at stage left and stage right of the alpha stage, as well as an area of over 500 square feet for the terraced levels of the beta stage that project outside the Chrysalis proper. Popular music acts on the alpha stage, including rock or hip hop performance (see the figure above) or DJs playing electronic dance music (EDM), with the audience seated or standing on the lawn. Theater, dance, orchestral, and chorus performances on the alpha stage, with the stage being large enough to support a symphony orchestra with close to 100 performers and a backing chorus of comparable size. Smaller performances with the audience seated on the alpha stage itself, with 100-150 people seated in one or two banks of seats and the performers either at center stage or at stage right (near the beta stage). Larger events with 300-400 or more people seated on the stage, for example for a lecture or book reading (see the figure above). Performances on the beta stage with audiences seated or standing on the lawn. In practice each event will be slightly different, with the size and shape of the Chrysalis stage providing the flexibility for creative presenters and event organizers to select the configuration that best helps them achieve their particular artistic and business goals. Chrysalis theater features, clockwise from upper right: technical specifications, including load capacities for lighting and speakers; the grid of “strong points” for hanging lights and speakers for performances on the alpha and beta stages; location and capacities of electrical switches; and storage space under the alpha stage. (Click for a higher-resolution version.) Image © 2016 Inner Arbor Trust; used with permission. Of the possible configurations and their requirements, the most demanding are those needed to accommodate popular music acts like those that form the majority of the performances at Merriweather Post Pavilion and its associated music festivals. One aspect of the public image of major rock stars is that they make whimsical and often nonsensical demands of the venues in which they perform. Of these the most famous is the “no brown M&Ms” rule associated with the rock band Van Halen: that they be served a bowl of M&M candies in their backstage dressing rooms, with all brown M&Ms removed. Thus when designing the stage the Chrysalis team looked at technical riders for acts that might play at Merriweather Post Pavilion and had particularly stringent requirements. One result was the choice of stage size mentioned earlier. Another was the height of the Chrysalis, designed to provide a 60 feet wide and 36 feet tall proscenium opening at the front of the alpha stage, and a performance “box” 30 feet in height (and 50 feet wide by 40 feet deep) even before allowing for rigging above the stage. The Chrysalis and its stage are designed to address many other issues, including providing a sturdy stage floor that can also be easily repaired as needed, drainage for the stage, fire suppression, ADA access to the stage for people using wheelchairs or otherwise having limited mobility, sturdy but attractive railings to prevent falls, a loading dock and lift to bring equipment from the dock to stage level, storage under the stage for unused equipment, and so on. The most important requirement, and a major influence on the final form of the Chrysalis, is to support elaborate rigs for lighting, speakers, suspended scenery, and related elements. The Chrysalis structure supports several dozen “strong points” and multiple “line sets” for hanging production elements.2 Each strong point on the alpha stage is rated to support up to 2,200 pounds of vertically suspended weight, almost as much as a typical subcompact car. (Beta stage strong points are rated to support 1,000 pounds.) The entire set of strong points and line sets, including strong points at the front of the alpha stage for speakers, can support up to 46,000 pounds, equivalent to ten SUVs. The end result is a professional theater and stage that provides “expected technology in an unexpected form”, as Ed Arenius, Associate Principal of Arup, put it: all the features needed for modern musical acts and other performances in a flexible and beautiful structure that is a far cry from the typical outdoor amphitheater. “About Us” page from the Arup web site. Ove Arup’s “Key Speech” outlining Arup’s philosophy, mission, and organization practices. Arup’s theater consulting and acoustic consulting practices. “Unabashed Designers of Delight” [121-minute video] (November 18, 2013). A presentation introducing the design team for the Inner Arbor plan. It includes a presentation by Raj Patel beginning at 1:39:30 that discusses a number of Arup theatrical projects. “Brown Out”. Snopes.com investigates Van Halen’s “no brown M&Ms” demand. “Merriweather Post Pavilion Production Information”. Includes detailed technical specifications of the stage and other features for acts playing at Merriweather Post Pavilion. “How to Make the Perfect Tech Rider for Your Band”. A good example of what goes into a typical technical rider, although it doesn’t make much mention of lighting requirements. “Fly system”. A Wikipedia article that provides a good overview of the components and complexity of the equipment needed for a modern stage production. “Stagecraft Industries Site Glossary”. A glossary of technical terms used in the context of theaters and theatrical productions. Michael McCall’s presentation of the Inner Arbor concept plan to Leadership Howard County [33-minute video] (September 20, 2013). The Chrysalis portion of the Inner Arbor pre-submission community presentation (December 2, 2013). Michael McCall’s presentation to the Howard County Design Advisory Panel [20-minute video] (February 26, 2014).